“Megaphone” horse-trading on Yerevan’s Liberty Square. Political horse-trading before, after and in between elections is a common feature of politics in many countries, but none more so than in the South Caucasus were deals are cut behind the scenes, usually by leaders of parties or groups, without any reference to their political supporters, let alone the voters. It is one of the features that has helped discredit politics in the region. Often political support is traded for government positions, on some occasions in the past it is alleged that also big sums of money were involved. Despite their totalitarian streaks governments in the region have in the past found it useful to engage in such practices as a means of widening their support, and sometimes to isolate political opponents who refused to be bought and had become difficult. Armenia has been particularly vulnerable to this sort of murky politics and most political forces had been engaged with it one way or the other. Events of the last few weeks, in the immediate aftermath of the 18 February Presidential election, have therefore come as a welcome change. 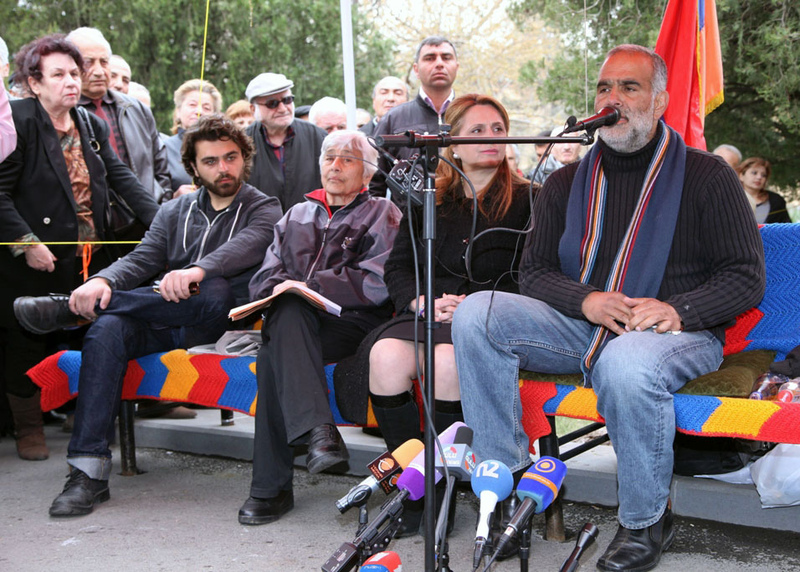 Following that election the runner-up, Raffi Hovannesian has contested the result, even though it seems it has been endorsed by the international community and has survived a legal challenge. Hovannesian has taken his protest to the streets. He has held one meeting with the current Presidential incumbent, who was declared the winner on this occasion too, but nothing much seems to have come out of that. After a brief tour of Armenia’s regions he has for the last days camped on Armenia’s main square, Liberty Square, has gone on hunger strike, and has by and large conducted negotiations with the government on the issue “by megaphone”. President Serzh Sargsyan seems desperate to bring Hovannesian back to the usual practices. He keeps inviting him for a meeting at the Presidential Palace. Hovhannesian keeps saying that the meeting should take place on Liberty Square. Hovhannesian has also engaged in horse-trading, with the difference that he has made his “cost” public. In a letter to the President he has asked for early elections under a revised system and a number of key positions in the government – essentially he has offered power sharing of a sort, or new Presidential elections. “People’s forums” are taking place on the square where the public and the media are regularly informed of the latest developments. Hovhannesian has promised that everything will be done openly and before the people, and said that his conscience does not permit him to do any secret deals, and that in any case will not accept for himself a government position. It seems that horse-trading on Liberty square has become as transparent as the New York Stock Exchange. People wonder if it is real. There is of course the possibility that behind the public drama another conversation of the traditional kind is going on. But there is an awkwardness in the mood of government officials in Yerevan that indicates that their current discomfort is real. It is not clear how this latest saga in Armenian politics will end. The President is due to be sworn in for a second term on 9 April. One suspects that things will play out in some form or other by that time, not least because Hovannesian cannot remain on hunger strike for ever. One thing however is certain. Political horse-trading in the South Caucasus will never be the same again. Prepared by the CEW Editorial Team. Constitutional Court rejects appeal to annul Armenian presidential Elections. Yerevan tense as Hovannisian continues hunger strike.